+ A masterclass of the sommelier Sergio Serra and a gastronomic workshop with Steve Anderson, among the most outstanding activities. The Valencian cava once again takes the Mercado de Colón in Valencia for one of its most important dates of the year. On the afternoon of Friday, November 23, the sixth edition of a contest that has captivated the Valencian public in the previous editions. The event will last until 3:00 p.m. on Sunday 25. 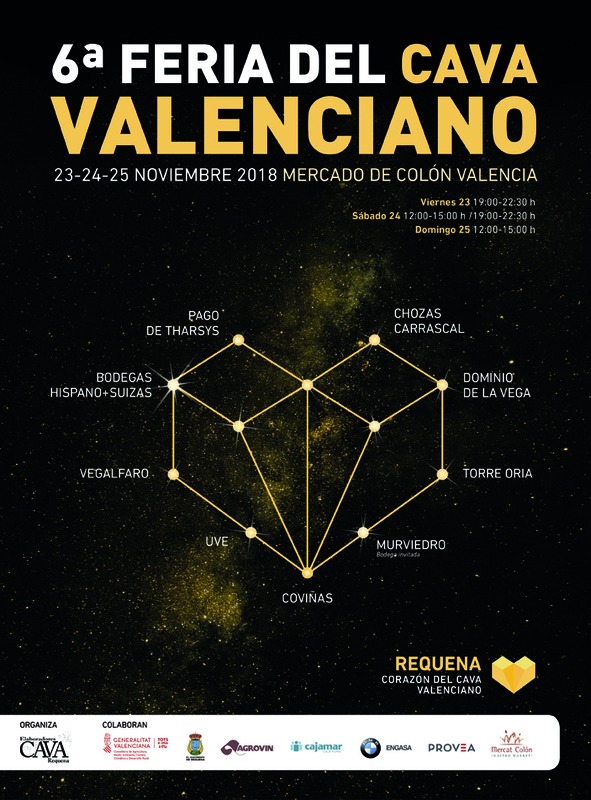 Organized by the Cava de Requena Association this year, the contest brings together the products of nine valencian wineries(Coviñas, Chozas Carrascal, Dominio de la Vega, Hispano Suizas, Pago de Tharsys, Torre Oria, UVE, Vegalfaro y Murviedro). If six years ago the Association of Developers, presided by Emilio Expósito, launched with this promotional event under the slogan “It’s our time”, the contest has been consolidated with strength being a special occasion for the Valencian public to be found are ‘their Cavas’, in an idyllic setting. The Valencian cava has already reached a production close to eight million bottles, showing that Requena has very advantageous climatic and soil conditions for the production of these sparkling wines, something that makes the municipality the “heart of the Valencian cava”. Proof of this is that Valencian people are present in the most prestigious cellar contests in the world. This year the event works with a single ticket of 10 euros with which the visitor can exchange two drinks of cava, two of cava reserva and one of gastronomy. It also includes a silk-screened glass to take it as a souvenir. In the gastronomic part, several stores of the Mercado de Colón will prepare a special offer on the occasion of the Fair. Thus, Ma Khin Café, Mi Cub, Suc de Lluna, Cervezas del Mercado, Martin & Mary and Casa de l’Orxata, will be present at the event with a remarkable gastronomic offer. As in previous occasions, the visitors participate in a lottery of a lot of cavas which this year is added an enopack weekend attraction to visit several wineries of the Association and spend the night in Requena (full board two people). The event has this year with BMW Engasa as official car, to which are added the sponsorships of Agrovin, Grupo Cooperativo Cajamar, Generalitat Valenciana and Ayuntamiento de Requena.